Look out for MONSTERS, a new composition textbook co-edited by third-year Brittain fellow Brandy Blake and former assistant director of the Writing & Communication Program Andrew Cooper. The textbook is part of the Fountainhead Press V Series, each of which focuses on a single, specific topic and its relevance to today’s world. Dr. Blake and Dr. Cooper offer definitions and examples of monstrosity that have arisen from the Gothic tradition. Through the readings and assignments, students will explore how those definitions affect modern perceptions of monstrosity. Though both low-tech and high-tech assignments are included in the book, the assignments, overall, emphasize multimodal approaches. It’s under the bed; it’s in the closet. It’s the thing in the basement, but it’s also the thing in the mirror, hot breath on the back of your neck, cold eyes staring at you with loathing and hunger. The selections in this text prompt you to think critically and learn about a phenomenon that stretches across multiple cultures and time periods and to participate in conversations about the issues that surround monsters and the monstrous. 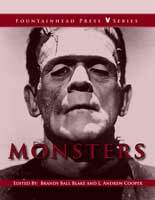 MONSTERS is also available through Amazon.